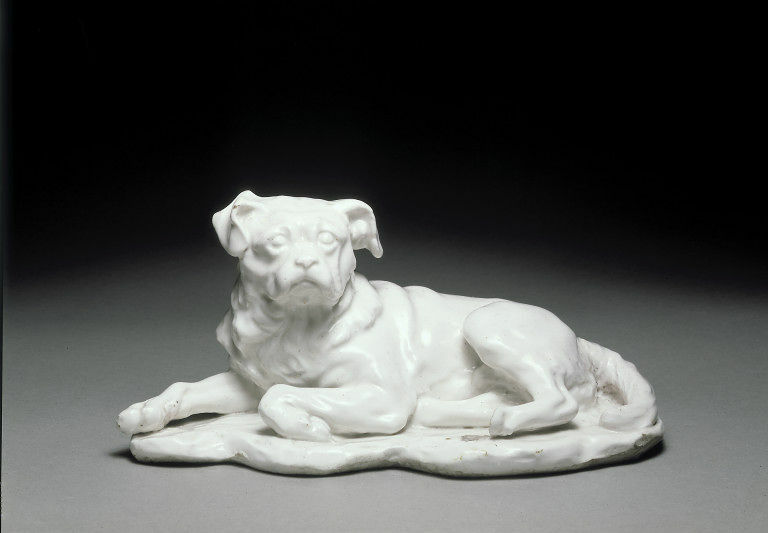 Trump was the pet dog of the artist William Hogarth (1697-1762), and porcelain figures of the pug were probably intended for sale to admirers of Hogarth's paintings and prints. They would probably have been displayed in libraries or other domestic interiors. Trump has a much longer muzzle than the pugs of today. Hogarth depicted Trump prominently in the foreground of his self-portrait of 1745 (now in Tate Britain). A combative personality, Hogarth identified strongly with his pet, and as a result was himself depicted as Trump in Pug's Graces, a caricature of 1753 by the watercolour painter Paul Sandby (1730-1809). The sculptor Louis-François Roubiliac (1705-1762) modelled the original terracotta on which this small sculpture is indirectly based. The manager of the Chelsea porcelain factory, Nicholas Sprimont (1716-1771), was a friend of both Hogarth and Roubiliac. Roubiliac's original terracotta of Trump remained with Hogarth's widow until her death in 1790, while plaster casts of the pug were sold among the sculptor's effects in 1762. The Staffordshire potter Josiah Wedgwood (1730-1795) made versions in Black Basalt. He based these on a cast bought in 1774 from the London plaster shop of Richard Parker. The Chelsea factory probably also based its version on a commercially available plaster. 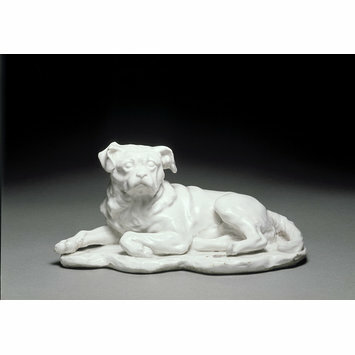 Figure of Hogarth's dog 'Trump', soft-paste porcelain.